The cone-shaped design fits into a variety of vessels, from a bedside decanter to your workout bottle. Those who practice Ayurvedic medicine—one of the world's oldest healing practices—believe health happens when your mind, body, and spirit are all happy. One way they say helps: copper-infused water. This design makes it easy, with a cone-shaped ceramic top that fits into a variety of vessels, from bedside decanter to workout bottle. Once you "charge" the water for eight hours, it can sit for long periods of time without going stale. The magic, as it goes, is in the metal. Made in India. 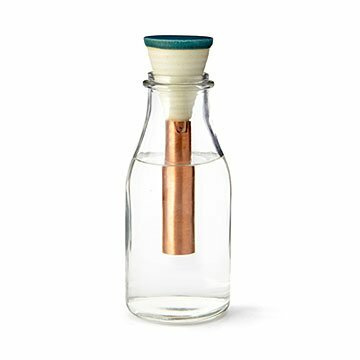 Water infuser should be washed daily with a soft cloth and a detergent/metal cleaning agent. Wipe dry immediately after washing to ensure no water stains are produced. Never use abrasive cleaning pads to clean your copper infuser.